Richard Mayson is the author, a renowned wine writer and critic, known for pieces such as Portugal’s Wine and Winemakers, The Wines and Vineyards of Portugal, or the best-seller, Port and the Douro. 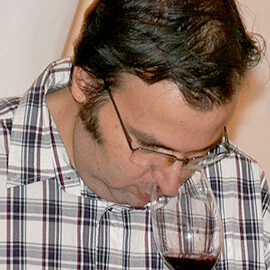 He possesses deep knowledge of Portugal’s wines, and is a specialist in the fortified kind. A fruit of decades of tastings and countless trips to Madeira, with many visits and conversations with producers, which enabled him to publish his new book called Madeira: the islands and their wines. Richard Mayson demystifies Madeira Wine as only a few are able to, and using a friendly register that even makes the book so delightful that I am now reading it for the second time. The author always begins with a historical introduction about Madeira, which includes a space dedicated to names of those who, according to him, helped mould Madeira into what the wine-producing region it is at present. He also adds a short introduction about the islands, touches on the social factor, the government, the climate, ending with agriculture. The lesson continues with an approach on the varieties and respective vineyards, expressing a vision of what they once were and his perspective on what they may turn into in the future. Without losing interest, we are brought along the vine production process in a simple fashion. Throughout the visit, the several categories of Madeira Wine are explained. It’s from this point onwards that this book makes all the difference and becomes even more essential to every connoisseur of Madeira Wine. Not only because of the detailed approach made to the many producers, but also due to the exhaustive and surprising long list of wines presented. On a passing note, the author uses an impressive register when he brings up the more recent news of a time-travelling experience back to the wines from the eighteenth century. At the back of the book, to complement the tasting notes, a very interesting description of the aromas that characterise Madeira wine is provided. It acts as a small tour guide around the island, and includes a little section that focuses on the link between Madeira wine and gastronomy. On the whole, a doubtlessly fundamental book. Pick up your copy and come get to know Madeira and its fantastic wines in a private tour created especially for you by Blend – All About Wine.